A top federal housing regulator on Tuesday shut the door on mortgage investors who had been using a loophole to access low-cost, government-backed financing. The Federal Housing Finance Agency said so-called captive insurance companies, which insure the risks of the companies that own them, no longer will be eligible for membership in government-backed federal home loan banks. Real-estate investment trusts that invest in mortgages are normally ineligible for home-loan-bank membership, but over the past few years have created captive insurers to gain indirect access to cheap federal funding. After the announcement on Tuesday, shares of some mortgage REITs with captive insurers, such as Annaly Capital Management Inc., Two Harbors Investment Corp. and Redwood Trust Inc., fell between 0.9% and 5%. Mortgage experts said the move is likely to make it even more difficult for some riskier borrowers who don’t fit the parameters of government-backed agencies to get loans. “It will make some loans to lower-quality borrowers even slower to come back,” said Laurie Goodman, director of the Housing Finance Policy Center at the Urban Institute, a think tank. Mortgage rates also could tick up, since the rules would effectively cut off some investment in mortgage bonds. On the other hand, some had feared that allowing captive insurers to get access could put the FHLB system at risk, as other types of firms like hedge funds and investment banks considered using the workaround. “Congress has had plenty of opportunities to give mortgage REITs access to the system, and they haven’t done so,” said Joseph Pigg, senior vice president for mortgage finance for the American Bankers Association, a banking industry trade group. The 11 regional federal home loan banks advance low-cost loans to financial institutions such as credit unions and commercial banks to promote lower mortgage rates. In shutting captive insurers out, FHFA Director Melvin Watt said the agency sought to abide by Congress’s intent when it passed the law governing the home loan bank system. As of the end of September, 40 captive insurers had become home-loan bank members and as of mid-November, they had outstanding borrowings of more than $35 billion. On Tuesday, the FHFA did roll back separate provisions that would have required home-loan bank members to keep a certain percentage of their assets in mortgages. That move is expected to help liquidity. The FHFA first proposed the changes in September 2014. A bipartisan group of congressmen in October last year introduced a bill that would require the FHFA to withdraw the proposal, though that legislation never left committee. Mortgage REITs that have already used insurers to get home-loan bank access will get some relief. Those that entered the system before the September 2014 proposal can stay members for up to five years, while those that became members after will have one year. Michael Widner, an analyst for Keefe, Bruyette & Woods, said that because of the uncertainty surrounding membership, mortgage REITs until now have hesitated to rely on the home-loan banks for a large portion of their funding. In part for that reason, he said he didn’t expect the FHFA’s decision to have a near-term impact on REIT earnings. Mr. Widner said 19 of 24 publicly traded mortgage REITs had captive insurers that were home-loan bank members. After six years of rising apartment rents in U.S. cities, investors from all corners of the real-estate industry are piling into new projects in a bet that the boom still has a long way to run. Over the next three years, developers are expected to build almost one million apartments in the U.S., more than the nearly 900,000 constructed over the previous three, according to researcher Axiometrics Inc. In 2014, multifamily rental construction reached 328,000 units, its highest in nearly 30 years, according to an analysis of U.S. Census data by Jed Kolko, a senior fellow at the Terner Center for Housing Innovation at the University of California, Berkeley. The main lure for investors: rising rents. Average rents nationwide rose 4.6% in 2015, the biggest gain since before the recession, according to real-estate researcher Reis Inc. Rents have increased by more than 20% since the beginning of 2010. Most economists expect 2016 to be another strong year. The average monthly U.S. apartment rent now stands at nearly $1,180, up from about $1,125 a year ago, according to Reis. Sales of U.S. multifamily apartment properties clocked in at a record $138.7 billion in 2015, up just over 30% from a year earlier, according to JLL, a commercial-real-estate-services firm. Last year, 4,915 multifamily projects were sold, up from 4,570 in 2014. But some real-estate analysts worry that most of the new construction has been aimed at the top 20% of the market. In all, 82% of the units built from 2012 to 2014 in 54 major U.S. metropolitan areas are classified as luxury developments, according to CoStar Group Inc.
“What concerns me is not so much the volume of construction but that there’s an intense focus on building the same thing: luxury properties in urban locations,” said Jay Parsons, director of analytics for MPF Research, a division of RealPage Inc., who has been advising clients to look more at vibrant suburban markets. The shift toward luxury is putting renters near the limit of what they can afford. In downtown Los Angeles, new one-bedroom properties are commanding rents in the range of $3,000 a month. According to CoStar, a tenant would need a gross income of $128,000 to afford one of those units, four times the median household income in the area of just over $29,000 a year. In Boston’s trendy Leather District, renters would need to make nearly $142,000 to afford average rents for newly built one-bedroom apartments of more than $3,500 a month, according to CoStar. The median income in the area is closer to $60,000. Despite the affordability issues, apartments are drawing interest from a broad swath of real-estate companies, including home builders that haven’t traditionally built multifamily housing. Toll Brothers Inc., primarily a single-family home builder, has 7,400 apartment units planned or under development, and company executives say that could double over the next couple of years. “All these trends supporting apartment demand are going to be with us for the foreseeable future,” said Charles Elliott, managing director of Toll Brothers Apartment Living. Major office landlords, such as Mack-Cali Realty Corp. also are focusing more on apartments. The company, which was solely an office landlord before 2010, through acquisition and development has amassed 7,000 units and plans by 2019 to more than double that to 15,000 units. “Most people forming households today are not buying,” said Michael DeMarco,president of Mack-Cali. Urban markets are especially hot. The number of apartments completed in 30 major downtown city centers hit more than 54,000 for 2015, according to an estimate by Axiometrics, a 20-year high. Toby Bozzuto, president and chief executive of the Bozzuto Group, a Washington-area builder, said he has seen an influx in the past few years of newcomers that once specialized only in office or retail but now are dabbling in apartments. He remains bullish on the apartment market, but has concerns that investors are piling on and driving up land prices beyond what rents can support. Los Angeles-based Jamison, one of the city’s largest office landlords, is taking its first plunge into residential property. For two decades the company specialized in owning no-frills office buildings in the Koreatown neighborhood. Now its Jamison Properties LP unit is diving headlong into apartments, with 27 projects under development or in the planning stages. About a third of the new units are conversions of the company’s existing buildings, while the rest are new construction, including Jamison’s most ambitious project, two 35-story towers in downtown Los Angeles with 648 luxury units. Jaime Lee, CEO of Jamison Realty Inc., expects the market will start to slow in the next few years, so Jamison is breaking ground on some of its projects as quickly as possible. Some signs of strain are beginning to emerge. The vacancy rate for downtown apartment buildings in U.S. cities jumped to 6.1% in the third quarter of 2015 from 4.4% in the first quarter of 2013, according to Reis. During the same period, the suburban vacancy rate fell to 4.1% from 4.4%—suggesting some renters are leaving high-price inner-city areas and moving farther out. New projects in the third quarter were 49% unleased upon completion, according to CoStar Group Inc., up from 29% in the third quarter of 2014. “With all the new product being created skewed to luxury…we’re building lots of rental product but it doesn’t necessarily match up with what the demand really is,” said New York-based appraiser Jonathan Miller. Then again, analysts several times in this cycle predicted a slowdown in the frenzied rental market, only to see the boom continue for years more. Ms. Lee said she isn’t worried. Jamison aims to own properties for years and gets a large portion of its funding from friends and family, meaning it is able to ride out short-term fluctuations and rely on the long-term health of the market. “We are willing to make the heavy bet, not only for the convenience and affordability but for the fact that the cultural renaissance around Koreatown is just going to continue to build the momentum here,” Ms. Lee said. Apartment rents increased faster last year than at any time since 2007, a boon for landlords but one that has stoked concerns about housing affordability for renters. Average effective rents nationwide rose 4.6% in 2015, the biggest gain since before the recession, according to a report by real-estate researcher Reis Inc. The average apartment rent now stands at nearly $1,180, up from about $1,125 a year ago. Another report from Axiometrics Inc., a Dallas-based apartment research company, showed that rents increased 4.7% in the fourth quarter compared with the same quarter a year earlier, the strongest year-end performance since 2005. The fourth quarter “wrapped up an incredible year for the apartment market, probably the strongest we’ve ever seen,” said Jay Denton, senior vice president of analytics at Axiometrics. Rents have marched steadily higher for six consecutive years, in part because of tough lending standards for home buyers and in part because of a shortage of apartments for middle-income renters. The homeownership rate in the third quarter stood at 63.7%, near a 30-year low. Unlike home prices, which crashed during the recession and have taken years to recover, rents scarcely dipped during the downturn. Since then annual increases have accelerated from 2.3% in 2010 to about 4% in each of the last two years. Over the last 15 years, rents have increased by an average of 2.7% annually, according to Reis. In general, the higher rents go, the more difficult it will be for young people to save for down payments, making them likely to rent even longer. The percentage of first-time buyers among all home buyers is at its lowest level in three decades, according to the National Association of Realtors. In some cases, meanwhile, professionals well into their 30s are choosing to rent rather than buy, preferring the financial flexibility and the proximity to restaurants and bars. Alezandra Russell, a 34-year-old founder of a nonprofit, and her husband sold their five-bedroom house in suburban Maryland in 2014 in favor of an 800-square-foot apartment they rent in downtown Baltimore for about $2,500 a month. Analysts say the apartment market is showing some early signs of peaking. Vacancy rates rose slightly in the fourth quarter to 4.4% from 4.3% in the previous quarter. The main factor: a flood of new supply, which is especially likely to weigh on rents in high-end buildings in downtown areas. In all, more than 188,000 apartment units were completed in 2015, the most since 1999, according to Reis. Bob DeWitt, president and chief executive of GID, a Boston-based apartment owner and developer, is currently involved in developing 15 apartment projects across the country. But he said the increased competition is starting to limit how much more rent tenants are willing to pay. “We certainly believe that over the next two or three years rent trends are going to slow and in some places they may actually back up,” he said. Both reports showed that some of the hottest markets in the country are finally starting to cool, while smaller, less expensive ones are starting to heat up. That might reflect the fact that the affluent renters that dominate those markets are reaching the limit of how much they can afford and are moving to older buildings or neighborhoods farther from downtown. Rents in the San Francisco area increased 7.6% year-over-year in the fourth quarter, compared with 11.8% in the third quarter, according to Axiometrics. Rents in San Jose increased 7.1%, compared with 9.9% in the third quarter. Meanwhile, rents in Portland, Ore., traditionally a more affordable city, jumped by 12% in the fourth quarter from a year earlier, Axiometrics said. Kimberly Minasian Sparks, a rental broker in Portland, said a few years ago she could easily find clients a one-bedroom apartment in the $900-a-month range. Today, she is lucky to snag one for less than $1,500. “It’s not sleepy little Portland anymore,” she said. Much of the new demand in Portland has been driven by people fleeing cities such as Seattle and San Francisco, where rents have shot up beyond what many people can afford. Diana Comstock, a 42-year-old painter, moved to Portland from Santa Barbara last summer. She said the local moms’ group she belongs to on Facebook is full of people decrying huge rent increases driven by people coming from out-of-state. Cambridge, Mass., a hub for prestigious universities and biotechnology companies, is setting aside apartments to help an unexpected group of people find lower rents: families with incomes topping $100,000. The city recently held a lottery for 15 units with below-market rents, in a new building a few subway stops from downtown Boston. A family of four with an income well into the six-figure range—a maximum of $118,200—could qualify for some of the apartments. The city received at least 45 applications. Many places around the country are grappling with how to address the need for more housing that’s affordable for people like teachers, nurses, firefighters and waiters. Few federal subsidies are available. At the same time, skyrocketing construction costs have made developers focus on building luxury rentals, not middle-class housing. At least half a dozen municipalities—including New York City, San Francisco, Jupiter, Fla., and Portland, Maine—are moving to require or coax developers to set aside some rental units in new developments for middle-income families, some of whom in pricier areas bring in six figures. In Cambridge, home to Harvard University and the Massachusetts Institute of Technology, median rents have soared about 36% since late 2010 to $2,750 a month, according to Zillow, a real-estate information company. That’s higher than the median rents across the five boroughs of New York City, which run about $2,295, though not as steep as the $4,128 median rents in Manhattan. Advocates for the poor are skeptical of such programs, which they say divert attention from the most needy. “It is frustrating to hear about the use of scarce resources to serve higher-income households,” said Linda Couch, senior vice president for policy at the National Low Income Housing Coalition. Nearly half of U.S. households making $30,000 to just under $45,000 a year pay more than 30% of their incomes on rent, considered a financially sustainable level, according to Harvard University’s Joint Center for Housing Studies. 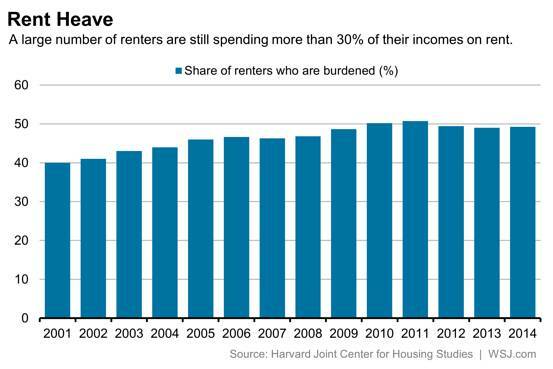 For renter households making $75,000 to $150,000, the share of cost-burdened renters is 5.5%. Many policy makers say programs are needed to help middle-income people, too. “When we’re talking about the silent housing crisis, we’re not talking only about the low-income people…the people we’re talking about are middle class,” said Ron Terwilliger, a former real-estate executive and chairman of the Terwilliger Foundation, which advocates for affordable housing. Mr. Cotter noted Cambridge already has a program for low-income residents that isn’t affected by the new initiative. The pilot program for middle-income housing relies on a zoning requirement and doesn’t require an additional city subsidy. The need for programs targeting middle-income earners reflects a couple of national trends: Cities around the country are becoming more desirable places to live for people of all ages and income levels, from young professionals to retirees, driving up apartment rents. At the same time, incomes have largely stagnated in the wake of the recession. Nationwide, over the past five years, median rents have grown twice as fast as incomes, to more than $1,380 a month, according to Zillow. Lee Herman recently won a New York City housing lottery aimed at middle-class residents, exchanging a cramped, outdated studio in a walk-up on Manhattan’s Upper East Side for a brand-new one in a Queens elevator building near the waterfront, with views of Manhattan. The 48-year-old bank employee, who has a bone condition, said he struggled to climb the stairs to the third floor in his old apartment. Mr. Herman, who earns well over the New York City median household income of about $53,000, submitted one of more than 93,000 applications for 925 apartments in the Queens building, which opened to residents in May. His monthly rent of just under $1,700 is roughly the same as for his previous rent-stabilized apartment, but the new place is much nicer, he said. Developers have largely accepted the middle-income housing requirements because they are often allowed to build taller projects in exchange. Still, they caution that if cities continue increasing requirements that developers devote a part of their projects to below-market-rate housing, it may become financially unfeasible for them to build big apartment complexes. In Jupiter, a seaside town of 59,000 in Florida’s Palm Beach County, local officials said the restaurant and hotel workers who keep the local economy humming were being forced to drive long distances to get to work. Most new construction has been single-family homes, not apartments catering to those workers. “In the last 10 years people weren’t building the more affordable units,” said John Sickler,director of the planning and zoning department. The town passed an ordinance in May requiring developers to set aside rental or for-sale units for low- and middle-income families or pay into a fund. These affordable apartments rent for as much as $1,850 a month for a three-bedroom, compared with market rents of about $2,000. Cities have struggled to retain their middle class for decades. In the 1950s, New York designed a program known as Mitchell Lama that built some 140,000 units of middle-class housing. Back then, the program was designed to keep middle-class families from fleeing crime and poverty in the city. Decades later, the city wants to help middle-class families who want to stay afford to do so. Most recently, Blackstone Group LP agreed to purchase the city’s most famous middle-income housing project, Stuyvesant Town and Peter Cooper Village. New York officials agreed to contribute $225 million to protect 4,500 units for middle-income tenants making up to $142,000 for a family of four.